Your Recover My Photos license key will be immediately sent to you. Enter your Recover My Photos key into the program activation window to activate the ability to save files. What license is best for me? Professional license: A Recover My Photos 'Professional' license is for all versions of Windows. It works with computer hard rives, cameras, camera cards and other removable media. An activation key can be used on two physical PC's, e.g. a home desktop and home laptop. Data Recovery Technician: A Recover My Photos 'Data Recovery Technician' license is intended for users who perform data recovery services for third parities. It includes all the features of the Professional license, but in addition to a software key, a license key is also provided on a hardware dongle so that it may be taken from machine to machine to perform the recovery. New camera, video and music file types have been addded, including: mts, m2ts, nef, arw, crw and more. The program interface has been streamlined. We have re-designed the drive selection window, making it easier to see which drive letters are attached to which physical drives. It is now possible in Recover My Photos to run a search for deleted or lost files, save the search results and then reload the search results at a later time. Important! - If you use this feature, avoid writing any new data to the drive in the interim. If you do, the contents of the drive will have changed and the search results may no longer point to valid data (i.e. it could be overwritten and destroyed by the new data). File saving has had a major overhaul. Options now exist to: skip empty files and folders, ignore large files, rename illegal file characters etc. 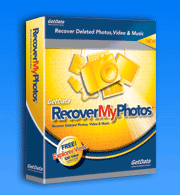 Recover My Photos has a new and more robust CD/DVD burning engine. It will provide a compatibility with a wider range of CD/DVD burning hardware. Recover My Photos continues it's ability to burn directly from the search screen to CD/DVD without creating temporary files during the process. Find: a powerful tool to search through scan results for specific files based on user criteria. It is possible in Recover My Photos to directly search an image of storage media. Supported image formats include EnCase.e01, and DD or RAW.